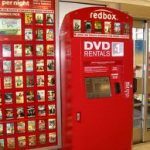 Redbox just rented its three billionth movie from one of those red kiosks you see in grocery stores and drugstores. To say thanks, it’s offering a free movie or game. Get the promotional code Thursday, August 1, on the Redbox Facebook page. It’s valid in any Redbox location. The 3 billionth Redbox rental, The Call, was rented at a Walgreens in Littleton, Colorado. The next Redbox rental was a PlayStation 3 game, The Last of Us, rented at a Walmart in Kennesaw, Georgia. Three billion rentals is fairly awesome. Put the 3 billion discs laid side by side and they’d wrap around the world nearly nine times (almost 224,000 miles). More than 68 percent of the U.S. population lives within a five-minute drive of a Redbox location. There’s a list of them at redbox.com/locations.